You really can’t make this stuff up. 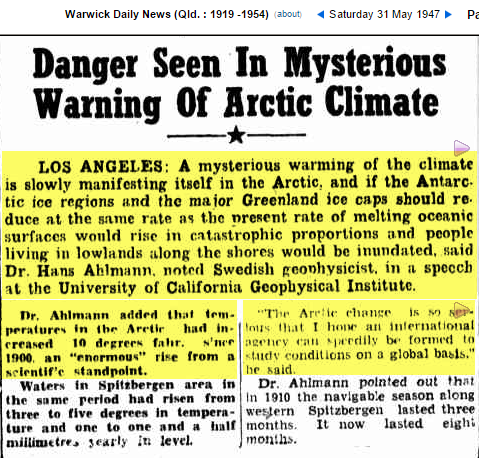 Climate scientists are plagiarizing 75 year old scare stories for their latest alarmism. 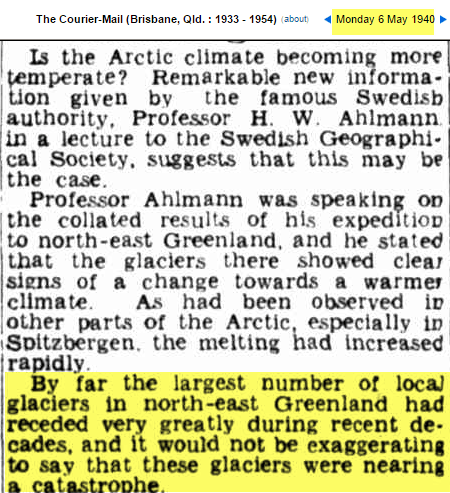 Seventy five years ago, most of the glaciers in Northeast Greenland were on the verge of collapse. And scientists needed money to study it. The scientists as well as the politicians need to be held accountable for fraud! 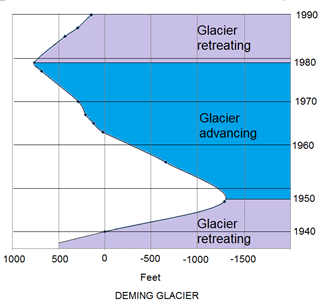 Let’s also look at a glacier with good long term data. It was all just part of the NATIRAL CYCLE. And this one is fun to match things to. El Niño weakens. And growing SOI. The alarmist always neglect mentioning an El Nino is the manifestation of energy in the ocean headed for space. Yep, it’s weakening and the warm water never did move east up against the coast as it did during the last big one and in fact there is pretty cold upwelling along the coasts of S. America. It is becoming doubtful there will be a break in the pause. 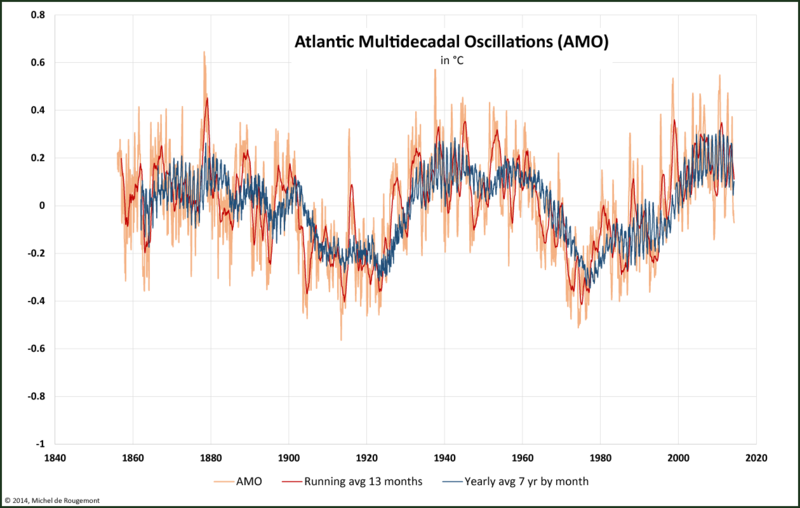 Alarmists also neglect to admit that El Ninos are a natural occurence and there is not a bit of hard evidence that their occurrence or intensity are a manifestation of AGW. It’s been almost totally dry here in southern California. We had more rain in August than October, (we typically get about .01″ total from May through September) and barely a drop yet in November. Santa Barbara county is currently averaging 52% of normal for the season to date. So far, El Nino is a flop for us. Of course, there’s still that pool of warm water off the coast of Oregon and Washington. It’s usually given as the reason the land of fruits and nuts has been so dry, so it’s continued presence might make El Nino moot, at least for California rainfall. For the sake of an actual impending crisis, (a city of 15 million people running out of water, as opposed to political warm mongering) I hope this El Nino dip is only temporary. And I hope I’m wrong about The Blob overpowering it. But that’s not my gut feeling. That is the major problem with living in a desert during after a wet spike with a bunch of left wing Eco-nuts running the government. Israel no longer worried about its water supply, thanks to desalination plants: Israel has gone through one of the driest winters in its history, but despite the lean rainy season, the government has suspended a longstanding campaign to conserve water. The leader of that country is the one Obummer snubbed and through a hissy fit about. Shows the current US leadership is NOT concerned with what is the best for the American people only in money and power and a global government. Sadly, the current eco nut has made it his life’s work to destroy the plans his own father made for dealing with this problem. Pat Brown, for all his faults, gave California an infrastructure that could handle 30 million people, and plans to double that. Jerry Brown, on the other hand, has spent 3 1/2 terms blocking those plans, and even tearing down some of what was already finished. And he does this while inviting millions more people to move here from Mexico. And the scariest part? By the standards set by other California politicians, Moonbeam is rightly seen as rational, and moderate. He legitimately is to the right of the state legislature, on almost every issue. Things will REALLY get bad when Gavin Newsom takes his place in a few years. We tried desalination here, back in the 90’s. When the rain came, they abandoned the just completed facility. In the last two years, there’s been some talk of rebuilding it. That talk pretty much ended when Moonbeam made it clear he would no longer honor Santa Barbara’s existing permit, and wouldn’t issue a new one. With the Paris-ite Circus coming to town you just can’t have anything that competes! qualifies Viner as a clown. Wasn’t this fellow a major warmist? On the other hand it sounds like the original Peter Ward retired, did extensive research and came to the same conclusion as the rest of us. A tempest in a teapot thats only use is funding a certain group of Paris-ites at the expense of all the others. At least the 1930’s provided plenty of evidence showing unusual heat, unlike the last 10-15 years. This glacier has “dramatically” melted, and nobody noticed any sea level rise. 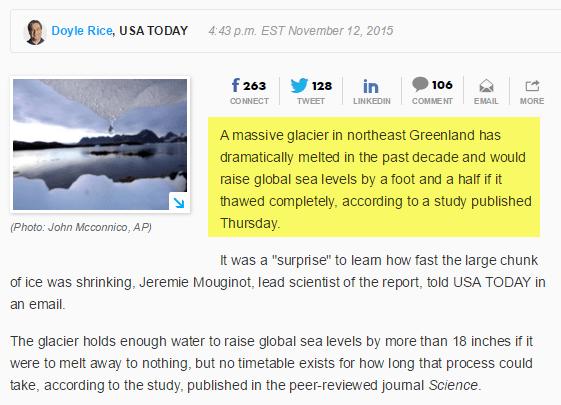 If this glacier completely melts we’re in for 18″ of sea level rise. It sounds like we have a LLLOOOONNNGGG way to go. In fact, the sea level DID rise dramatically! It just so happens that the ocean floors all dropped dramatically at the same time, leaving the old observed rate of sea level rise unchanged. Wheeeeew! This catastrophism stuff is EASY! Is this the same glacier, with a drilled ice core showed the oldest ice layers were less than 5,000 years old? …The range of Asp-inferred bivalve ages at each site corresponds well with independent records of early Holocene ice retreat and late Holocene ice advance. Furthermore, the frequency of Asp-inferred bivalve ages from the three widely separated locations is nearly identical, with most ages between 5 and 3 ka, coinciding with optimum oceanic conditions. Because ice margin changes in western Greenland are tightly linked with oceanographic conditions, the distribution of reworked bivalve ages provides important information about relative ice margin position during smaller-than-present ice sheet configurations…. Rignot et al always pick obscure places that no-one has heard of and which are rarely visited to claim ‘dramatic melting’ – same in Antarctica. 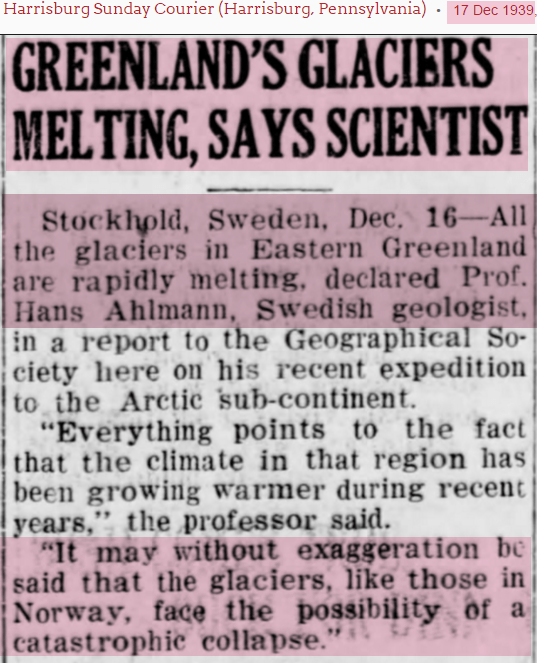 It goes back even further Zubov commented that 1934 it was melting at catastrophic rates. 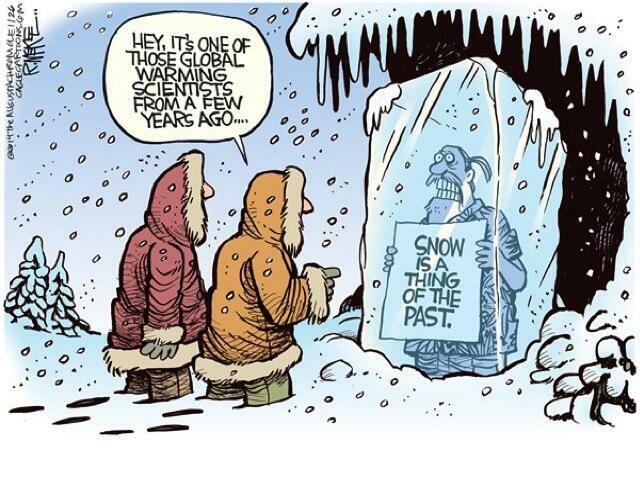 Not only is the climate scam very old, it also echoes with the cry wolf hollow ring of dire global meltdown meme.